In view of the strategy under New Industrial Policy the Government is pleased to introduce a "Scheme for Assistance for Startups / Innovation" which will come into force from the date 1.1.2015 and will remain in operation for a period of five years. 1. Rs. 10,000/- per month will be provided to the innovator as sustenance allowance for one year whose project is recommended and approved by institution’s Screening Committee. 2. Up to Rs. 5 Lakhs assistance will be provided to the institution for mentoring service annually. 3. Institution will support to the innovator by providing mentor services. 4. Marketing/publicity assistance of up to Rs. 10.00 lakhs will be provided for the introduction of innovated product in the market. 5. Project of Innovated Product will be assisted in getting Venture Capital. 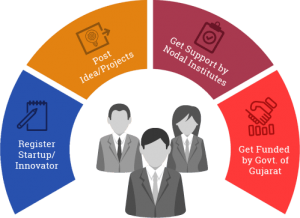 Step 1 The institution which intend to promote the Startups, will submit its proposal through online application form for approval of State Level Implementation Committee (SLIC) as Nodal Institute. Step 2 The innovator will approach institution with his proposal of innovative idea/concept for recommendation. Step 3 The Committee will approve idea/concept of an individual or group of individuals duly recommended by institution. Step 4 The institution will submit proposal to IC office to avail assistance for providing mentoring services and the committee will sanction the assistance based on number of innovators. Step 5 The institution will submit proposal to Industries Commissioner to avail assistance for Cost of Raw material/ components & other related equipment required for innovation. Step 6 The selected candidate whose project is approved by the committee will be eligible for sustenance allowance for one year and it will be paid by Industries Commissioner. Assistance to the Nodal Institution will be released by Industries Commissioner. Step 7 Once the idea get commercialized, the Innovator will apply to Industries Commissioner to avail benefits such as venture capital assistance, marketing/publicity support and apply to DIC for assistance under MSME scheme and Net VAT reimbursement etc.